In this post I’ll cover why I wanted to have a decent multi-node Hadoop cluster on my laptop, why I chose not to use virtualbox/VMware player, what is LXC (Linux Containers) and how did I set it up. The last part is a bit specific to my desktop O/S (Ubuntu 13.10). Why install a fully-distributed Hadoop cluster on my laptop? Hadoop has a “laptop mode” called pseudo-distributed mode. In that mode, you run a single copy of each service (for example, a single HDFS namenode and a single HDFS datanode), all listening under localhost. This feature is rather useful for basic development and testing – if all you want is write some code that uses the services and check if it runs correctly (or at all). However, if your focus is the platform itself – an admin perspective, than that mode is quite limited. Trying out many of Hadoop’s feature requires a real cluster – for example replication, failure testing, rack awareness, HA (of every service types) etc. Why VirtualBox or VMware Player are not a good fit? Consume plenty of RAM per guest – always a premium on laptops. Consume plenty of disk space – which is limited, especially on SSD. To run many guests on a laptop, a more lightweight infrastructure is needed. LXC is a lightweight virtualization solution for Linux, sometimes called “chroot on steroids”. It leverages a set of Linux kernel features (control groups, kernel namespaces etc) to provide isolation between groups of processes running on the host. In other words, in most cases the containers (virtual machines) are using the host kernel and operating system, but are isolated as if they are running on their own environent (including their own IP addresses etc). In practical terms, I found that the LXC containers start in a sub-second. They have no visible memory overhead – for example, if a container runs the namenode, only the namenode consumes RAM, based on its java settings. They also consume very little disk space, and their file system is just stored directly in the host file system (under /var/lib/lxc/container_name/rootfs), which is very useful. You don’t need to statically decide how much RAM or virtual cores to allocate each (though you could) – they consume just what they need. Actually, while the guests are isolated from each other, you can see all their processes together in the host using the ps. command as root.. Some other notes – LXC is already used by Apache Mesos and Dockers, amongst others. A “1.0” release is targeted next month (February). If you are using RHEL/CentOS, LXC is provided as a “technical preview” on RHEL 6 (likely best to use a current update). If you want a detailed introduction, Stéphane Graber which is one of the LXC maintainer started an excellent ten-post series on LXC a couple of weeks ago. So, how to set it up? The following are some of my notes. I only tried it on my laptop, with Ubuntu 13.10 64-bit as a guest, so if you have a different O/S flavor, expect some changes. All commands below are as root. By default, LXC uses DHCP to provide dynamic IP addresses to containers. As Hadoop is very sensitive to IP addresses (it occasionally uses them instead of host names), I decided that I want static IPs for my Hadoop containers. That should cover more containers than I’ll ever need… My naming convention is that the host name is hadoop[rack number][node number] and the IP is 10.0.1.1[rack number][hostname]. For example, host hadoop13 is located at rack 1 node 3 with IP address of 10.0.113. This way it is easy to figure out what’s going on even if the logs only have IP. If you run into networking issues – I recommend checking the Ubuntu-specific docs, as lots of what you find on the internet is scary network hacks that are likely not needed in Ubuntu 13.10 (and didn’t work for me). This is pretty standard… You should just set up ssh keys, maybe create some O/S users for Hadoop, download Hadoop bits from Apache or a vendor and get going… Personally, I used Apache Hadoop (1.2.1 and 2.2.0) – I have set things up on a single node and then clone it to create a cluster. Obviously, you can set a smaller cluster, based on your cores / RAM / disk / workload etc. Very interesting article. I will definitively look into lxc. Total noob here, but wouldn’t the entry ‘LXC_DOMAIN=”lxc”‘ in lxc.net allow you to use names like this: hadoop11.lxc and you don’t have to worry about making static ip addresses? I am looking to setting it up like that…but not sure how to do with dnsmasq.conf file. Gonna try that with hadoop. If it doesn’t work, then I will fall back to your method. Thanks for the comments and link Paul! Technically, you are right. However, my problem is that in many cases, Hadoop processes log things by IP address, not hostname (I haven’t figured it out entirely, something about Java default host name resolution semantics). So, I’d rather have simple static IP addresses that easily map to rack+node. Thanks for your great posts. These are so helpful for me to study pattern of replication. Anyway i got a problem, which is a discordance between lxc-net i set and address derived from fsck(-racks option). I made 3 racks, and each rack has 2 nodes. My naming pattern was same as yours. But i set these address on GUI LXC Web Panel not using CUI. Of course, i wrote correctly /etc/hosts and Hadoop’s conf/masters, conf/slaves. 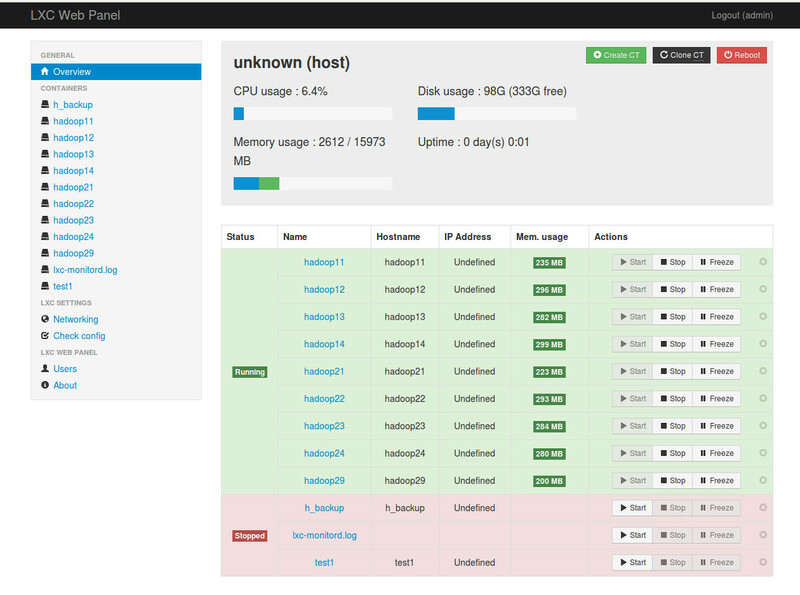 LXC/Hadoop works very well. I didn’t get any error message related to IP address. But when i wrote ‘bin/hadoop fsck /test -files -blocks -racks’, i got unexpected IP addresses. (d_rack01 is default rack value. i used your topology.script.sh.) So, i checked topology.log. It should’ve been 10.0.3.111, 10.0.3.121 …. 10.0.3.131, 10.0.3.132. It’s really make me become a yellow-faced elephant. Could you tell me details that you set? I want to know how you did ‘2. Setting the network’. I added ‘LXC_DHCP_CONFILE=/etc/lxc/dnsmasq.conf’ to ‘/etc/default/lxc’ file because I don’t have ‘/etc/default/lxc-net’ file. And I made ‘/etc/lxc/dnsmasq.conf’. But It still doesn’t work correctly. It is the problem that is caused by allocating static ip to host. I think that allocating IP using LXC Web Panel is not applied correctly. I just saw your messages. It seems that your static IP definitions don’t work, that’s why you see that DNS has leased dynamic IPs to your servers. I didn’t try to assign static IP address using the GUI, so I can’t comment on it. 2. Point LXC_DHCP_CONFILE to that file. Hi Ofir 😉 nice to see you in fantastic technical shape again! We miss you definitely. LXC looks like Solaris legacy. Thanks a lot Marek! I hope HAWK is starting to get some traction in Europe. I got stuck on static ip assignment to the containers using LXC_DHCP_CONFILE flag. I am using Ubuntu 13.10 and installed lxc via apt-get. Fist of all there in my configuration I did not have the lxc bridge config file “/etc/default/lxc-net” as mentioned in the original article. Rather, I had “/etc/default/lxc” instead. Setting the LXC_DHCP_CONFILE=”/etc/lxc/dnsmasq.conf” in this file did not help either. I traced the problem down to the /etc/init/lxc-net.conf file where the dnsmasq command is actially issued. On inspecting the /etc/init/lxc-net.conf file, I found no references to the “LXC_DHCP_CONFILE” variable. I than restarted the service sudo nano /etc/init/lxc-net.conf and sure enough the container picked up the ip address I had specified in /etc/lxc/dnsmasq.conf file. Interesting, you are directly using LXC instead of docker. Would you agree that using docker would simplify the steps creating those 29 containers? I would likely try to move to docker sooner or later… At the time I thought about it, it seems to me docker (was version 0.6) was still not mature enough. Anyway, I thought trying lxc first would be useful (gain experience with the infrastructure). Thanks for the reply, Ofir. I’m interested to know how you set up the single Hadoop node and then clone it to create a cluster, because both LXC and Hadoop are new to me. Care for a follow up blog? Thx. Thanks for the followup and the link (below) for your Dockers blog. I think I’ll have time to follow up in another post only in a month (busy days…), likely for Ubuntu 14.04. BTW, if you ever want to get started with Docker, maybe this will help. can someone clarify my below doubts about lxc container. 1) Is it possible to install jdk at host level and use the same jdk in all containers? 2) Is it possible to customize the lxc ubuntu template to contain by default java or any common software which is required for all containers (like chef, git..etc)? Don’t think so, its chroot environment.. But sure you can have that freedom based on what apt sources you are using since you always use custom course into the template in-fact, write you own handy template instead use the default one, this is plenty straight forward and plane shell script.. Thanks for your tutorial!! I would like to certificate CCAH. I must practice and I thought use your way to install hadoop. By these way I understand that I can install for example two namenode with HA?